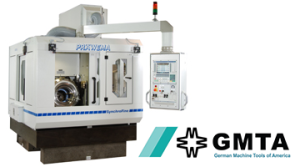 Now available from German Machine Tools of America (GMTA), the Präwema SynchroFine 205 HS gear honing machine features direct-driven, digitally controlled spindles for the tool and the workpiece, enabling precise, rigid synchronization. The Präwema Honing gear finishing process produces quality comparable to grinding results for spur and helical gears, as well as shafts. The machine’s software checks the stock allowance and workpiece runout and then optimizes the X-axis approach distance. Measuring the workpiece does not affect the cycle time and the process can reduce cycle times by 3 to 5 sec.